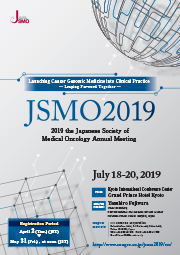 We are pleased to host the Japan Society of Medical Oncology 2019 annual meeting at Kyoto International Conference Center and Grand Prince Hotel Kyoto on July 18-20, 2019. In 2019, several diagnostic tests with NGS (Next Generation Sequencing) will have been approved by the PMDA (comparable to US-FDA)/MHLW, with full coverage under the National Health Insurance scheme in Japan, thrusting cancer genomic medicine to take center stage. Thus this is set as the main theme of the meeting, marking the arrival of a new era. Tumor agnosticity, translational research, bioethics and social medicine such as health economics, all imperative to cancer genomic medicine, will each be focused on, to give stakeholders a multilayered perspective, to thoroughly discuss the present and future of cancer genomic medicine. As we believe it is ever more important at this transitional period that clinicians and researchers engaged in cancer treatment work together as a team, we chose the motto “Leaping Forward Together,” for the convention. In cancer research and medicine today, it is of paramount importance that patients, communities, and academia coordinate the roles they each play. Provision of medical services across national borders are accelerating. Not only physicians, but nurses, pharmacists, medical laboratory scientists, physical therapists, radiology technicians, nutritionist and clinical research coordinators all play key roles in providing patient centered medicine, and in conducting research. Thus the forums are designed for much more diverse participants, for medical specialists, patients, and their families. This year, travel funds are expanded, towards a stronger southeast Asian representation, ensuring participation from all corners of Asia and globally. We look forward to hosting a larger and truly diverse forum, and to engaging with all in stimulating and dynamic discussions.